Emerald Pink Phlox is a low mounding groundcover that will spread and spill over rock walls or curbs. The foliage is semi-evergreen through the winter. It will grow to a height of 4" to 6" tall and spread from 12" to 18" wide. It has deep pink blossoms that cover the plant in late spring. 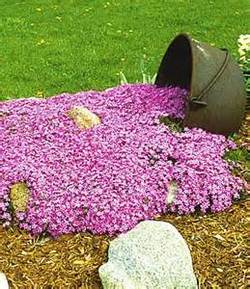 Plant Emerald Pink Phlox in a rock garden or allow to spill over a wall or curbing. It also is a great addition to a mixed container for a splash of color in spring. Plant in full sun and well drained soil. When in bloom, this plant will attract butterflies. It is deer resistant and drought tolerant once it is established. Emerald Pink Phlox is also a Firewise plant. After blooming, shear back the foliage to keep it compact and tidy looking.